When I was a little girl, my little Italian grandmother use to make us coffee. Yes, way back in the day, I was drinking ice coffee from a baby bottle! Maybe that is why I love coffee so much! She always used an on stove peculator and the coffee was so rich and flavorful and delicious. When I was looking for items to add to my Valentine Gift Guide, I wanted to find stuff that was different than the ordinary. 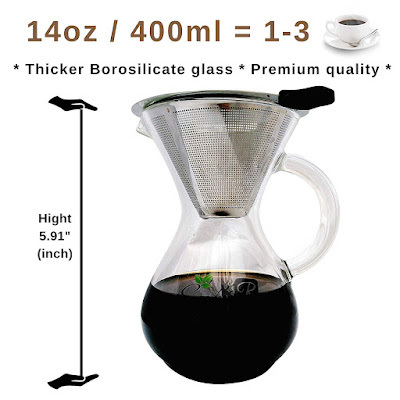 I received an email about the EasyR Pour Over Coffee Brewer and was immediately intrigued. My first thoughts went back to my childhood and my grandmother's coffee. I immediately contacted the PR rep and told them I was very interested in trying it. They were happy to oblige and sent me one to try. When the EasyR came I was so excited. It was nicely boxed with the coffee carafe, filter, lid and even a coozie to keep the coffee warm. I decided to give it a try right away and I wasn't disappointed. The manufacturer prefers a medium coffee ground which I had on hand. I simply added some to the strainer, poured in my hot water and let it do its thing. The coffee was so rich and delicious. The process of making coffee this way allowed for the flavors to really shine through in the coffee. Clean up was a breeze too. I prefer to wash my EasyR by hand, but it can easily be placed in the dishwasher. 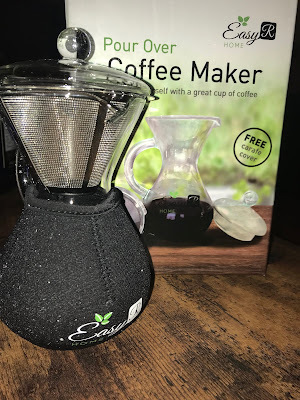 The accompanying filter is stainless steel and rinses clean easily after placing the used coffee grounds in a safe place for my garden and plants. I am going to be saving a lot of money by using this. I normally buy k-cups which are convenient, but there is nothing like a fresh brewed and steeped cup of coffee. This makes an adorable way to serve coffee to a loved one. This Valentine's day, the EasyR would make a wonderful gift or addition to your breakfast in bed.